Company Overview | - DSI DOCUMENT SOLUTIONS, INC.
We are a family owned and operated business with six offices covering the entirety of New Mexico, and an additional regional office in El Paso, Texas. DSI helps medical, academic, and government institutions respond to changing technological needs while improving the efficiency of imaging and networking processes. Our team-oriented sales approach is distinctive within the office technology industry. We are not here to sell printers or network hardware to you. We are here to be your trusted advisor on developing and implementing business infrastructure to meet your organization’s needs. In order to deliver the best possible imaging, document, and network solutions to our clients, we maintain excellent relationships with a broad range of manufacturers and service providers. This means our customers are not tied down to a single solution or manufacturer – we will recommend brands and solutions that offer the greatest value to your business. We do everything in our power to offer complete interoperability between different business solutions. Our Konica Minolta and Mobotix solutions feature open API architecture that allows for total flexibility. One way this approach helps our clients is by allowing them to extend the functionality of their existing print fleets and network components. Rather than following a profit-oriented rip-and-replace routine for our clients, we take the time to find optimal solutions whenever possible. This approach has helped more than 30 school districts in the state of New Mexico to achieve superior cost-savings compared to national averages. Our company provides the support and resources of a national corporation alongside the flexibility and ease of communication that only a local independent company can offer. With highly developed logistics solutions in place across the entire state of New Mexico, we are able to serve our customers’ needs with speed and professionalism. From obtaining key imaging hardware to making sure you get print consumables delivered on-time, our team satisfies in even the most demanding circumstances. This approach has made DSI one of the largest independent professional service providers in New Mexico. We love what we do and do it well as a result. We are well aware of the fact that national corporations offer services similar to ours. But DSI is different – as a local, independent office technology provider, we are able to offer better, faster, and more complete solutions to our clients than the large national providers. One of the ways we make this possible is by granting our customers total access to our team members. When you rely on DSI for your document solutions or network infrastructure, the buck stops with us. That means there is no corporate ladder to climb in order to get customer service queries resolved. There is no corporate bureaucracy between your business needs and our unparalleled expertise. Instead of centralizing our services like national providers do, we leverage relationships with tier-one global manufacturers to provide value. technology we are able to generate value for our customers with ease. 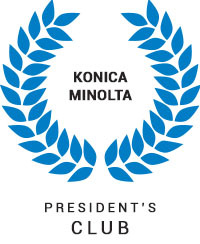 This approach has earned us the distinction of being a Konica Minolta President Club member. We distinguish our services by supporting everything on our client’s networks – from print consumables to the network hardware itself. Additionally, we are one of the only independent technology providers in the region to enjoy access to national contracts – like CES, AEPA, GSA, NASPO, and other healthcare GPOs. This lets us offer clients a critical edge over national corporate providers who are typically the only ones capable of managing contracts of these types. DSI offers multi-level support that includes a local, knowledgeable customer service department, and three levels of service leading to national support. No matter what kind of issue your company is facing, we have the tools, technology, and expertise you need to see it resolved. Our customers trust us because our team is focused on standardizing solutions to office technology environments. We never recommend tools or hardware our clients don’t need, and our solutions are flexible enough to support any customization or feature an organization may require. If it turns out we are not the best choice to implement any one of these solutions for your business, we will gladly recommend you the local provider who is. Our code of ethics simply doesn’t allow for anything less than a stellar job – no matter who fulfills the order. For DSI, the relationships that we build with our customers are part and parcel to the value we deliver. We know that our customers need more than imaging and networking hardware – they need imaging and networking solutions. Hardware is just one part of a package that also includes workflow optimization, consulting, deployment, and ongoing preventative maintenance. By combining all of these value-generating services under the umbrella of a comprehensive managed solution, DSI helps organizations thrive. Find out how our company can help yours enjoy the infrastructure needed for market-leading growth. History of DSI – DOCUMENT SOLUTIONS, INC.
DSI has 6 offices across New Mexico; extends offerings to include VOIP and security. 20+ years in business & COMPANY REBRANDED. Opens office in El Paso, Texas.